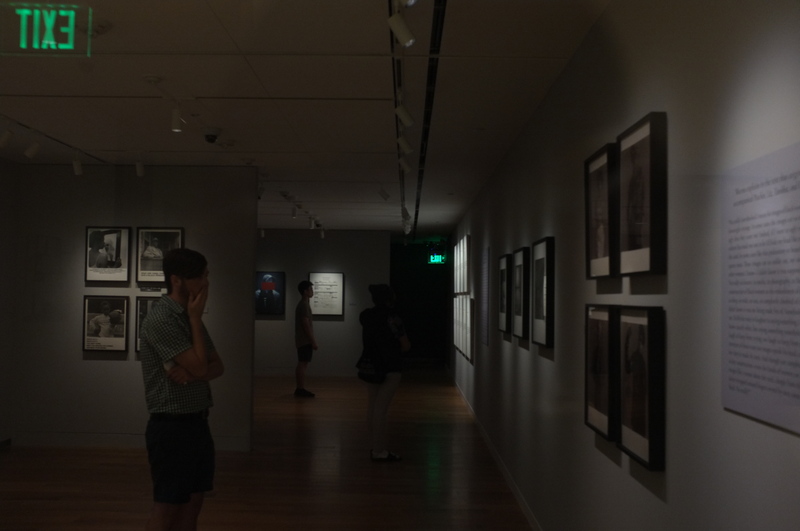 Carrie Mae Weems’s Strategies of Engagement has evoked all sorts of emotions from McMullen Museum visitors this semester—but perhaps no part of the exhibition is quite as captivating as “Lincoln, Lonnie and Me,” the Pepper’s Ghost installation on the second floor Daley gallery. In order to reach the installation, visitors must duck around a curtain and enter a small space similar to a theater. Inside the theater, “Lincoln, Lonnie and Me” plays on a loop, but not on a video screen. Instead, it makes use of the Pepper’s Ghost effect, creating what appears to be holograms out of thin air. In “Lincoln, Lonnie and Me,” Weems introduces a number of characters, including everything from Abraham Lincoln to a boxer, who discuss things like revenge, change and persistence. Weems has said that “Lincoln, Lonnie and Me” is intended to function as a quasi-history of segregation. But how exactly does Weems create the Pepper’s Ghost effect? It is actually simpler than one might expect. It involves inserting a pane of clear glass at an angle into the stage area. People looking into the stage area don’t see the glass, but it helps create the hologram effect. Meanwhile, everything else in the theater is completely real. There is no video screen, just the curtains and the hologram created by the Pepper’s Ghost effect. The Pepper’s Ghost effect was first theorized as far back as 16th century. It became widely known in the nineteenth century, and earned its name after the English scientist John Pepper helped popularize it in theater productions. Nowadays, people can see the Pepper’s Ghost effect at everywhere from DisneyLand to music festivals and, of course, the McMullen Museum.